This Section is currently being rebuilt and will include more information shortly. - What is Super8 ? - Which equipment do I need ? - Available SUPER 8 filmstocks !!!! - Notching system on cartridges - Film cost/ is processing free ? - Where can I have my films processed ? - How long does a film last ? - Can I use expired films ? - What's the story with Sound ? - VIDEO TRANSFERS !! NEW !! - I have unprocessed K40. What do I do? - S8 FILM SUPPLIES IN IRELAND!! What is Super 8 ? Super 8 is an 8 mm film gauge who currently enjoys a renaissance throughout the world. It was introduced as a simpler form of consumer filmmaking in the late sixties. Film comes in a cartridge that is slipped into the camera for filming. Most Super 8 cameras have automatic aperture functions for easy use. When developed, the cartridge is broken open, the film processed, and sent back to you on a reel that can be threaded into a Super 8 film projector or an editing screen for viewing. Entering the eighties, video took over and all the wonderful cameras and filmmaking equipment was no longer manufactured. Beaulieu in Italy and Quarz in Russia are currently the only companies still manufacturing super 8 cameras. Super 8 lives on though. The format was championed in the early eighties by the New York underground punk scene. Small groups of Super 8 filmmakers can be found here and there who enjoy the look of super 8 and its relatively small production costs. Which equipment do I need ? You need a super 8 camera + a projector or a viewing/editing machine for the viewing of your films. If you wish to edit your films, you can also get a splicer to cut and paste the parts you want to keep. You can also transfer your film to digital / video if necessary. There are many different ways or transferring from the DIY to the professional telecinema synched transfer. We offer the highest quality transfer service in Ireland (HD Frame by Frame) and can output to a number of video formats and codecs. 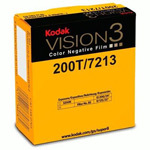 The main manufacturer of Super 8 films is Kodak. The most common S8 film used to be Kodachrome 40 (colour + silent) including free processing by Kodak. However Kodachrome was discontinued in June 2005 and replaced by a new filmstock: Ektachrome 64T (processing not included although certain labs have a film+processing offer). UPDATE: in June 2010, Kodak launched the Ektachrome 100D stock, which is a clear improvement from its 64T predecessor. Other companies have released new Super8 filmstocks and the more filmstocks (ie Fuji Velvia 50D) will be available in the next few months. - Kodak Ektachrome 100D Color / Silent / 100 ASA ! NEW ! This film gives great results and is made from Kodak Ektachrome 100D. It is rated at 100asa in daylight. - Fuji Velvia 50D Color / Silent / 50 ASA ! NEW ! cameras that can be set to 50 ASA." Reversal film* / Separate processing This film can be used without any further adjustment in most Super8 cameras as most cameras were built to recognize 40 ASA and 160 ASA film cartridges. If your camera only has automatic aperture and can't be adjusted manually, TriX and K40 are the only filmstocks that you can use. Reversal film* / Separate processing This filmstock is specially designed for telecine (professional digital transfer). We can scan this in HD quality. The result from processing is a negative image. This is why the film needs to be telecined in order to be viewed. Alternatively, a positive copy can be printed by Andec Film for projection. Reversal film* / Separate processing This filmstock is specially designed for telecine (professional digital transfer). Color / Silent / 64 ASA ! NEW ! 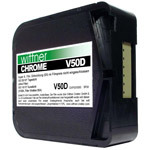 64T is the replacement filmstock for K40. It is a low grain (high quality) filmstock that can be processed in E6 chemicals. It means you can process it yourself if you have a super8 tank. Please note that a few cameras (ex Canon 814 & 1014) won't need any manual adjustment of the aperture. due to their advanced system to recognize the notch on film cartridges. Discontinued This 125ASA film requires a manual adjustment on the aperture on many cameras as most cameras were built to recognize 40 ASA and 160 ASA film cartridges. This stock was DISCONTINUED by Kodak in 2005. The Kodak Swiss lab closed down in September 2006 and the only other lab that could process that stock in colour (Dwayne's) stopped that service in 2011 as they ran out of chemicals. Once a film has been developped into a cine reel format, it ages very well, but anything that is left unprocessed in a camera for decades will gradually degrade up to a point that the image is barely visible. What's the story with Sound ? Sound films were discontinued in 1997 but DAT or MiniDisc offer a much more professional alternative. You can install a crystal sync system on some S8 cameras (Beaulieu, Canon etc) and projectors, in order to Sync with Nagra III tape recorders but it is quite expensive. The other option is to use a clapboard, so you can match the sound + footage in your video editing program. Since then, good value field recorders by Edirol, Zoom, Marrantz, M-Audio etc have been released that allow you to make very high quality recording onto SD cards. More information on those recorders soon. For example, look at the zoom H2 and H4-N.
Where can I find Super 8 films ? The most common film to find in Ireland was Kodachrome 40 until it was discontinued in 2005. Only one place in Ireland sells Super8 Film at this stage, so we have a steady supply of material and can ship worldwide. Gunn's don't stock Super8 film anymore, but is very helpful and reputable for anything else film related. This family run business across Whelans specialize in digital & film still cameras, darkroom supplies, DSLRs and Film for still cameras. The Dublin camera Exchange do not stock any Super8 Film anymore. They still have a selection of second hand still cameras, as well as DSLRs, so why not pop in to them and say hello from us! Very friendly crowd and centrally located (just off Dame St on Great George St south). They used to stock K40 back in the day, but do not stock super8 stock any longer. Very nice bunch though, if you need anything photo related. The Cork Film Centre on Pope Quay might have some. I need to double check. Film cost / Is processing free ? Processing for K40 was free until the end of September 2006. We can also process old Fujichrome, Agfachrome & Agfa Moviechrome, Peruchrome and other outdated emulsions. As long as the chemicals are available (old chemicals are becoming very rare and harder to source due to their toxicity), we will offer this service. Note that outdated stocks are more expensive and take time to develop, so if you have films already in reel format, we recommend focusing on these and having them scanned in HD. Turnaround on newer emulsions is much faster, as the chemicals are different and the demand higher. Where can I have my films processed ? EKTACHROME 100D / TRI-X / NEGATIVE FILMS etc. THE KODAK SWISS LAB FOR OUTDATED KODACHROME 40 ONLY HAS CLOSED. THE AMERICAN FACILITY TOO. All other stocks can be developed by the labs listed above. I have unprocessed Kodachrome 40: How do I get it processed? 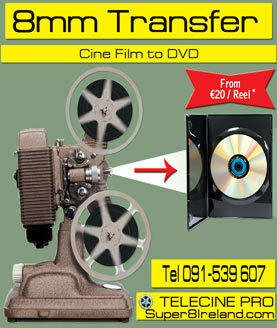 We offer a professional 8mm transfer service (both Super8 and Normal8) at a reasonable price. Email info@super8ireland.com or call us today on 091-539607 or 087-9040522 for more information. We do in-house frame-by-frame film transfers of the highest quality. We offer many options such as DVD authoring, editing and ordering of your films, adding music, colour adjustments etc. Our cine conversion service is an ideal Christmas gift. Convert your old family movies into DVD and share your memories with your friends. back-up your precious footage on digital format for further editing and storage purposes. DON'T LEAVE IT TO THE LAST MINUTE . . .
For private material, we generally output to DVD and Blu-Ray or .mp4 HD files. Should you wish to get some footage telecined, we also offer this service. You can capture the projected image with a video camera and then copy the film onto VHS or MiniDV for instance. Once the film is captured digitally, it can be edited on a computer and turned into a DVD. Bear in mind that this can be a lengthy process, especially the first time. The quality of this method can vary according to the equipment. Indeed a high quality 3CCD video camera (such as the Canon XM2) or a HD camera will give much better results than a regular handycam with no manual features and a smaller lens. A low end video camera will end up creating a lot of flicker, especially if your projector does not have advanced speed controls. The type of projector used for the transfer is as important as the type of video camera. First of all, the projector needs to be bright (at least 100W. The brightest being 150W). Older projectors often have low wattage bulbs (50W) which can be problematic for transfers. The quality of the lens (sharpness, and brightness) also has an influence over the quality. Secondly, projectors with variable speed are preferred to regular projectors. Elements such as the projector blade also have an impact on the transfer. It is best to project the image on two superimposed white A4 sheets 1 or 2 feet away from the projector, place the camera next to the projector and capture the projection. You can play with the video camera speed and aperture settings as well as the projector speed (when possible) in order to get the best results possible. This used to be a decent budget way to transfer Super8 and results could be acceptable when done properly. However, at this stage, it is a very outdated method, as scanners that used to cost hundreds of thousands are now much more affordable. Those boxes are suppose to be placed between the projector and the video camera for transfers but they are a waste of money. They add grain, create hot spots and give blurry images. Just use two superimposed A4 sheets instead. Results will be 100 times better. -- Buying your own telecine equipment: We sell some telecine equipment, should you wish to convert your own films semi professionally. How long does a films last ? Each film last approximately 3 minutes, depending on the speed of your camera (ie. if you shoot at 18, 24, 36 or 56 frames per second). At 18 frames per second, your film will last 3 minutes 20 seconds. At 24 frames per second, it will last around 2 minutes 40 seconds. Can I use expired films ? Yes. If the film has been stored in a cold place such as a refrigerator or a freezer, it ages much better than in other storage conditions. Different filmstocks also age differently. Should you be looking for out of date filmstock, we have a selection of expired carts. Contact us for more information. The notching system on S8 cartridges: what does it mean? Unlike Standard8 and 16mm cameras, Super8 cameras use filmcartridges. One of the advantage of those filmcartridges is that they are built in such a way that your camera will recognize the type of film used. How is that possible? Very simple. S8 cartridges have a notching system (like a hole) on the side of the camera according to the speed / sensitivity of the film (40 asa, 64 asa, 100 asa, 160 asa etc.). That way, when you insert your cartridge in the camera, your film is exposed properly by the camera's lightmetre. The only thing is: most super8 cameras can only recognize 40 and 160 asa films. Why? Because the only filmstocks available when they were built were 40 and 160 asa. This is the reason why most cameras won't expose newer filmstocks such as Ektachrome 64T, Wittnerchrome 100D, Plus X (100asa) or Vision NT (200 and 500 asa) properly. Their internal light metres will "think" the film used is either 40 or 160 asa. What can be done to meter those newer filmstocks properly, such as Ektachrome 64T? - Adjust the aperture on your camera manually when shooting. This page provides information on Super 8 cameras in order to help you choose the right camera. It explains the difference between different makes, lenses, shutters, exposure and film speeds.